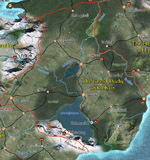 The story of the Aielund Saga takes place on an island roughly the same size as the United Kingdom, known as Feydwiir. It is a storied place, with over three thousand years of recorded history. Vast, central plains give way to majestic mountains in the north and south, allowing varied weather conditions throughout. Feydwiir is home to many civilisations, with what we in the real world would consider a late medieval era of advancement. Some smaller, poorer nations still dwell in a simpler existence, however, such as the mountain-faring Akoran tribal folk of southern Aielund. Although predominantly populated by the varied cultures of humanity, Feydwiir is home to other races, such as the descendants of the fey creatures of the forest - namely, the aloof elves and diminutive raelani. Shorter humans known as dwarves have adapted to life in caves and caverns, though they still maintain a surface presence near their kingdoms. Old tribal conflicts still linger despite the advance of civilisation, and the various cultures of Feydwiir maneuver and jostle for position over land rights, resources and old grudges. Politics and business can be volatile, and minor conflicts erupt over the slightest perceived insult. This isn't limited to the human lands either - the branching tribes of elves squabble over ancient controversies, while the dwarven clans attempt to reclaim old lands in the name of their ancestors. More than mere humanity, Feydwiir is also plagued with monsters of legend such and myth. Dragons, oversized beasts and the spectre of the undead haunt the land, challenging the reign of civilisation along the frontiers. Magic, once widespread and popular is slowly diminishing in the land, with fewer and fewer practitioners of worth maintaining the art. It is into this changing landscape that tyrants rise, kingdoms fall and heroes are made. The largest single kingdom on the island, and the most politically stable. Protected from southern incursions by the Hocarum desert. This is the primary location of the story in the novels. 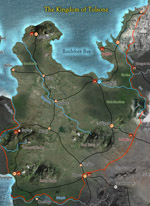 A collection of over thirty small islands off the southern coast of Feydwiir, populated by a reclusive offshoot of the diminutive raelani and a smattering of other races left over from the Kurhanic occupation, decades before. A wet, swampy place that is populated by hardy forest dwellers, and other less hospitable denizens. This land carries on traditions from the earliest days of human settlement, long forgotten in other parts of Feydwiir. Land taken from the Holy Ramidian Empire during an invasion from across the seas a century ago, the Kurhanic peoples are hard-working and industrious. This unnatural desert used to be a great nation known for its advanced arts and sciences. Few know the reasons why the land is poisoned and their cities laid to waste. Along with their cousins in Clydach, the hardy mountain folk of these highlands have resisted all attempts to remove them by the imperial forces to their south. 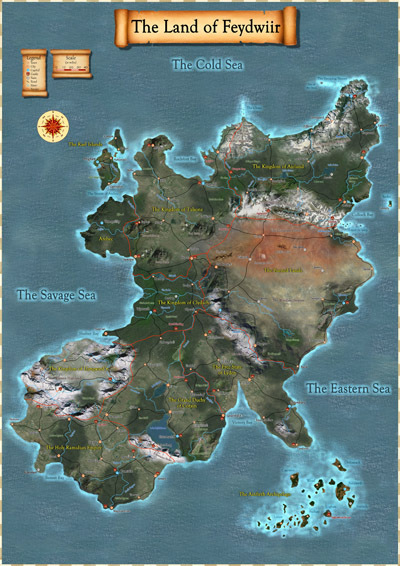 The first democratic state in Feydwiir, Lyden is populated by former slaves of the Ramidian Empire. Sometimes the only thing holding this country together is the threat from Kurhain next door and the will of its people to remain free. The Rael islands are home to a diminutive fey people commonly called 'raelani', who have settled their small islands and ply their trades upon the sea. Arebec is home to the last sizeable population of elves, fey people of the forests who live in tune with nature as they have for thousands of years. This empire used to cover the entire southern region of Feydwiir, though it had grown old, decadent and corrupt towards the end of its reign. The arrival of disciplined and powerful invaders from across the seas a century ago shattered the corrupt and decaying empire, with this prefecture the only remaining remnant of what once was. 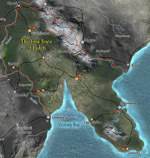 An obstinant and arrogant Kingdom, Tulsone is frequently a thorn in the side of its neighboring kingdoms as the Tulsonites try to expand their borders.